Preheat oven to 180°C/355°F. Add eggs, softened butter, sugar, vanilla sugar, and salt to large bowl and beat until creamy. Mix flour and baking powder in a second bowl, then add to butter mixture along with buttermilk and stir to combine. Divide batter equally into four bowls. Add red food coloring to the first bowl, green food coloring to the second bowl, blue food coloring to the third bowl, and leave the fourth one plain. Spoon all four batters alternately into a parchment-lined baking sheet until all are used up. Bake for approx. 25 min. at 180°C/350°F or until a tooth pick inserted comes out clean. Remove from oven and let cool down. To make the icing, sift confectioner’s sugar into a bowl, add lemon juice and stir to combine. 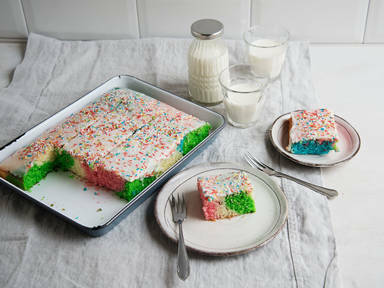 Spread icing evenly on top of the rainbow-swirl cake and decorate with sprinkles. Enjoy!